The first known survey of England was completed in 1086. That survey, presented as The Domesday Book, records a water mill on the site of the present day Cann Mills. 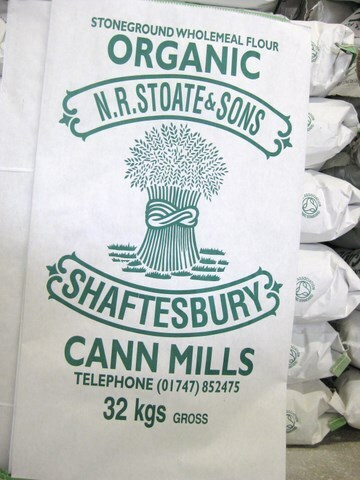 Today the mill is modern, although it still uses water for 25% of its power needs, and stones to mill grain into the flour that is sold as Stoate's Flour. Recently, Michael Stoate from Cann Mills was generous enough to participate in the BBC Countryfile/TCMG bake off, along with five other amazing millers and the editor of Countryfile, Fergus Collins. By coincidence, I had met Michael earlier this year. The setting is heavenly. The mill is in a valley about one mile outside of Shaftesbury. A lively little river feeds the tranquil mill pond that drives the water wheel. There are pigs in the front field and chickens scratching around in the vegetable garden at the back. His family took over the mill in 1947 and transformed it from an animal feed mill to a flour mill. Today Cann Mills produces just over 500 tons of organic and non organic flour per year. The bulk of the production is wheat, 60% of which is English and is grown within a 30 mile radius of the mill, and 40% of which is from Khazachstan. Michael explains that the content and quality of the gluten in the wheat from Khazachstan is higher and that, in his opinion, gives his flour a better and more consistent baking performance than if it was made with all local wheat. He also mills rye and spelt. 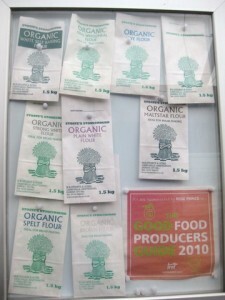 Altogether there are about a dozen different flours for sale, packed and shipped from the mill and used in the baking school that has been established on site. It was against the hum of the mill and the splashing of the water that Michael and I chatted, roamed around the mill and ate home made bread and local cheese. When millers buy stones they are smooth. 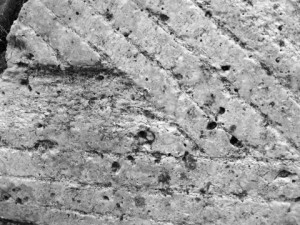 Before they can be used to mill grain, they are "dressed" by cutting an intricate pattern of grooves and channels into the stones. 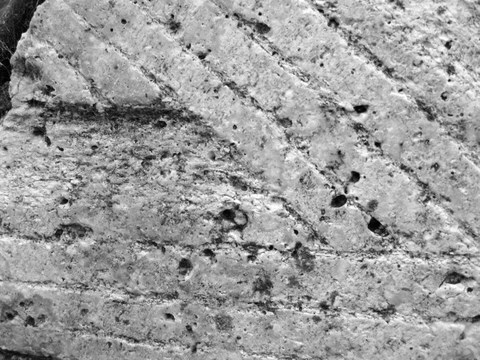 It is this pattern that defines the character of the flour. Three to four deep furrows make a harp. Between the furrows is the land. On the land there may or may not be stitching depending on whether or not the miller wants to cut up the bran as he or she mills. Once upon a time professional stone dressers went from mill to mill to dress and maintain mill stones using an iron hand tool called a mill bill. 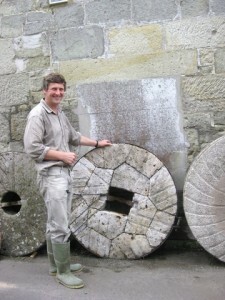 Michael did not know whether there were any professional stone dressers left in the UK as millers tend to dress stones themselves using both hand and power tools to get the effect they want. Michael's story about the origin of the expression "show me your metal" was told in an earlier post. Although the setting is idyllic, business is tough and the work is hard. Michael is miller, mechanic, engineer, wheel dresser, odd job man, chief financial officer, head of operations, innovations officer, marketing director and many other job titles all rolled into one. He is also a man who loves his work, having initially worked at the mill as a child and then as a summer employee between years at college. The pull was too strong. He did not go back to college and is now one of the UK's most experienced millers making silky, delicious flour that turns out tasty, fantastic loaves of virtuous bread. Visiting the mill I learned that just as the baker's personality is embedded in the loaf, so is the miller's personality embedded in the flour; and Michael Stoate makes great flour. Hi Jane, I love the web site - I was introduced to it by Harriet, a mutual friend. Fascinated by the early history of the mill in Shaftesbury. The Domesday Book also recorded eight or nine mills on the River Lee in Stratford in East London - visible on my iPhone app Time Travel Explorer. 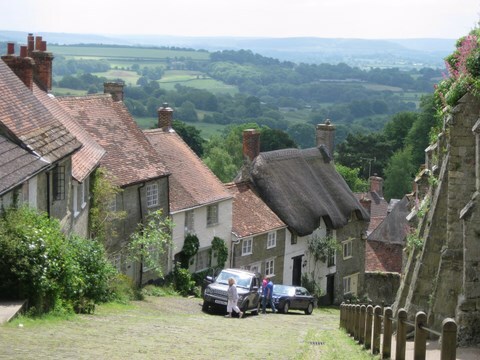 I think Shaftesbury has survived the centuries in much better shape! in fact, there were dozens of mills and now there are a mere handful, all of which are recorded by the Traditional Corn Millers Guild (TCMG.org.uk). The head of the Guild is called Nick Jones and he is a font of information!